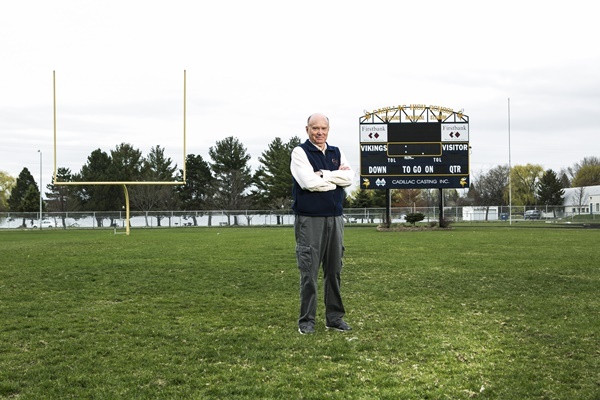 In 1973 the Cadillac High School Vikings football team finished undefeated with a perfect 9-0 record. Spirits were soaring as the 1974 season began, but the Vikings lost the first two games of the season. We coaches knew that the team was talented, but we also knew that the pressure of living up to the accomplishments of the previous year were causing the team to play below their abilities. We were looking for something to lighten the atmosphere and playing Rock and Roll in the locker room before practices and games was suggested. As the resident Rock and Roll expert, head coach Dave Brines gave me the task of picking the music. I chose a new and outrageous band -- KISS. They were wild, bold, and loud. Plus, their name invoked an old football credo -- Keep It Simple Stupid. It was a match that was meant to be. 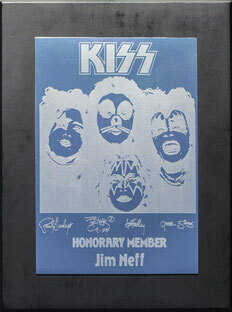 The 1974 team won its final seven games with KISS as an inspiration. The band heard about what we were doing and instantly adopted the Vikings as their team. 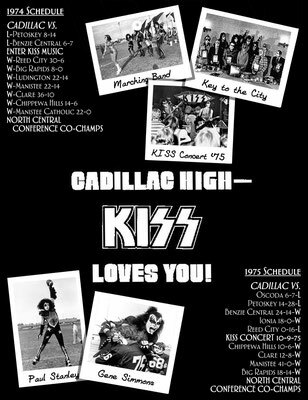 Then in October of 1975 the unbelievable happened, KISS came to Cadillac High School and played a homecoming concert in the high school gym. 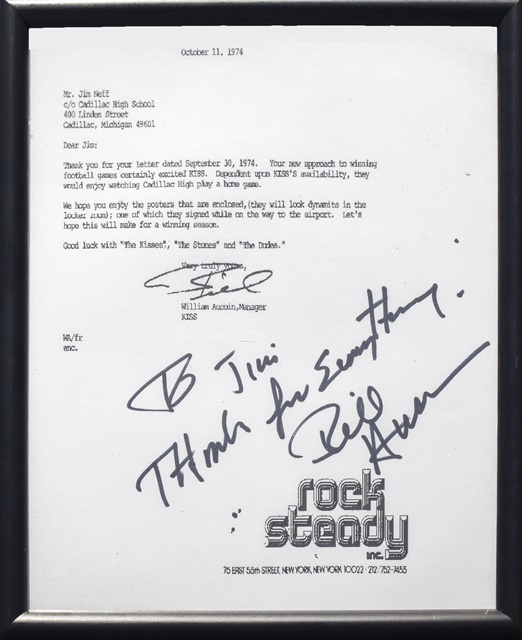 It's an event that has become a cornerstone of KISStory and a legendary event in Rock and Roll. The story has persevered throughout the years. This website presents photos, documents, videos, articles, unique features, and current news about the KISS visit. Added in 2015, Cadillac is now home to the only KISS Monument in the world. Over 8 feet tall, 5 feet wide, 5000 pounds, and laser-etched midnight black granite. It's a touchstone for every KISS fan! KISS brought their “End Of The Road” tour to Grand Rapids on March 9, 2019 and it was a night to remember for KISS Cadillac fans. As you looked around the crowd it was easy to spot all the KISS Cadillac tee shirts as fans were present in full force. 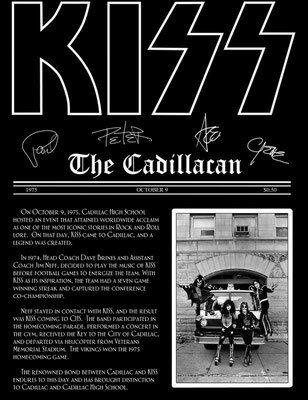 Cadillac has always been a key part of KISS history. 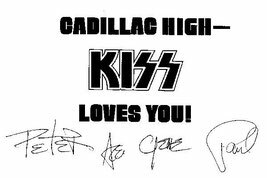 The connection between Cadillac and KISS is now being recognized in the official KISS “End of the Road” Tour Book. The bond formed by that 1975 visit continues to this day. Cadillac is home to the only KISS Monument in the world, a touchstone for KISS fans everywhere. More information at: KISSCadillac.com. The KISS “End of the Road” Tour Book is only available at concerts on the tour schedule (KISSOnline.com). 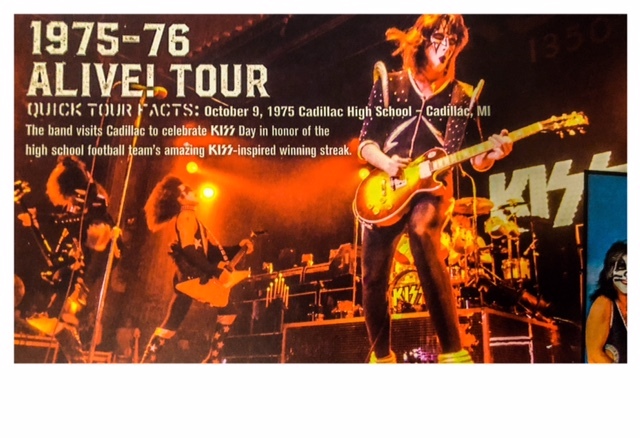 A flip-through of the tour book by KISSFaq.com can be seen at: https://www.youtube.com/watch?v=M9VaE069x6I. 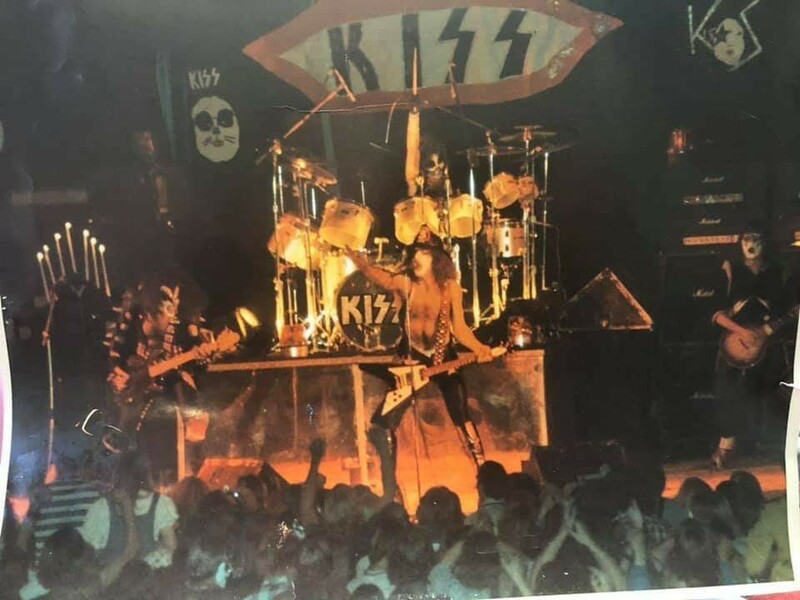 KISS Cadillac 1975 Named a Top Michigan Concert of ALL TIME! On March 30, 2016, MLive.com named the 30 Greatest Michigan rock concerts of all time. KISS Cadillac 1975 is on that list (slide 32). 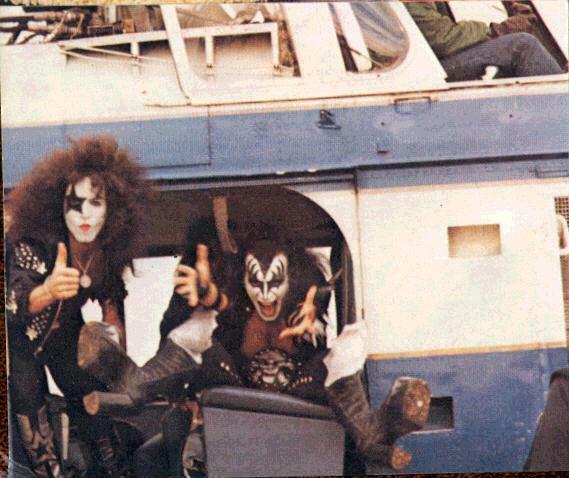 Pus, the front picture of the article is a KISS Cadillac photo. In October of 1975, Cadillac High School in Cadillac, Michigan made Rock 'n' Roll history when KISS played at their homecoming. Here is the full story about that visit presented by Jim Neff, the person who made it all happen. All those rumors you've heard about what took place are answered here. Included are never-seen photos, original documents, news articles, videos, and commentary. 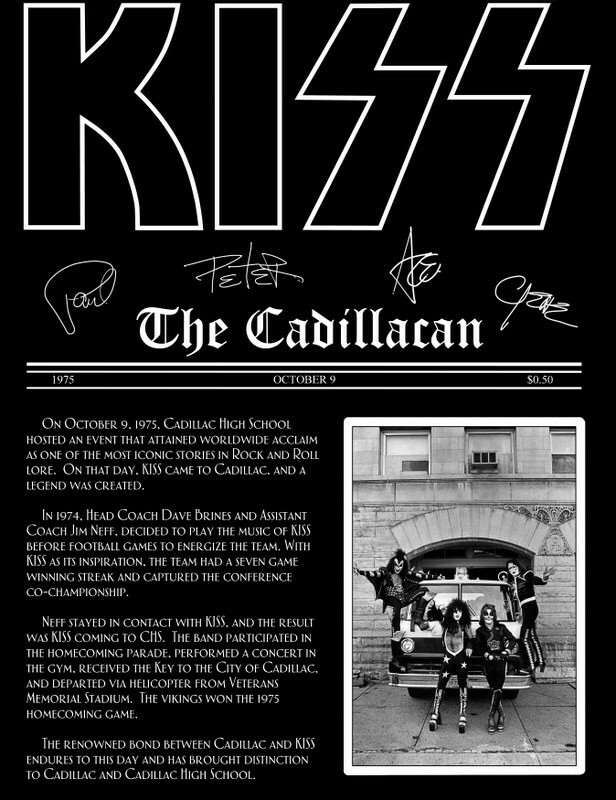 In October of 2015, Cadillac hosted the KISS Cadillac Homecoming 40th Anniversary Celebration. The story continues at KISSCadillac.com. John Laurent Passes Away. Cadillac High principal in 1975. Bill Smith Passes Away. CAPS superintendent in 1975. Neff Named Volunteer of the Year. Jim Meets Rock Legend Donny Hartman. This site powered by NeffZone.com. All rights reserved.